Our Equipment Leads the Way! You know, many companies say they have the best equipment, but here at the Crystal Cleaning Company we can prove it !Through our specifications, you will notice that the Crystal Cleaning Company’s equipment is unique and produce some very interesting numbers. When a company says “up to” what do they really mean? Take a look at the Equipment Comparison Page. We invite you to ask questions about the equipment. See the spec’s. As my grandfather use to say, “Numbers don’t lie”. 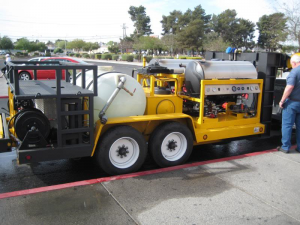 These are all good questions to explore and in our experience in purchasing generic prefab equipment, we found most manufactures say their pressure washer will heat water up to 200 degrees. Reality is they fall far short of those claims outside the labortories of where they’re tested. We find that these prefab equipment, when under full load, can only produce temperatures of 150 to 165 with a few hitting 180. In order to hit the 200 degree mark, you have to sacrifice the volume of water and in some cases, pressure. This is unacceptable when doing a garage floor. The end result is damage to your cement, and the removal process, is mediocre at best. 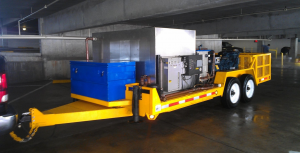 We at the Crystal Cleaning Company found that these machines average temperatures was inadequate for removing oil from the cement of a Parking Facility. You need at least 245 degrees under a full load to break the bond of the oil on a molecular level. PERIOD ! Our competitor’s boilers are only at 350,000 to 450,000 BTU’s. This is why they have to “Turn down the flow” in order to hit those 200 degree F. marks. Meaning, if they have a 6 gpm pump, they would have to reduce their water flow to 3 or 4 gpms so that the water flow has is less for their boilers to heat the water to a higher temperture. This would reduce the cleaning power of the machine and possible etch the cement with the thinner spray. Below is a chart supplied from a well known manufacture who says there machines hit 200 degrees. Look at what is needed to hit a 140 degree rise from a 4 to 6 gallon per minute pressure washer. Note the outside ambient temperture needed to hit a 140 degree rise.